We packed up on our last morning in lovely Olhos d’Agua, left the place ‘Airbnb ready’ (this has been our project for the month we spent there) and said a sad farewell to the Algarve. 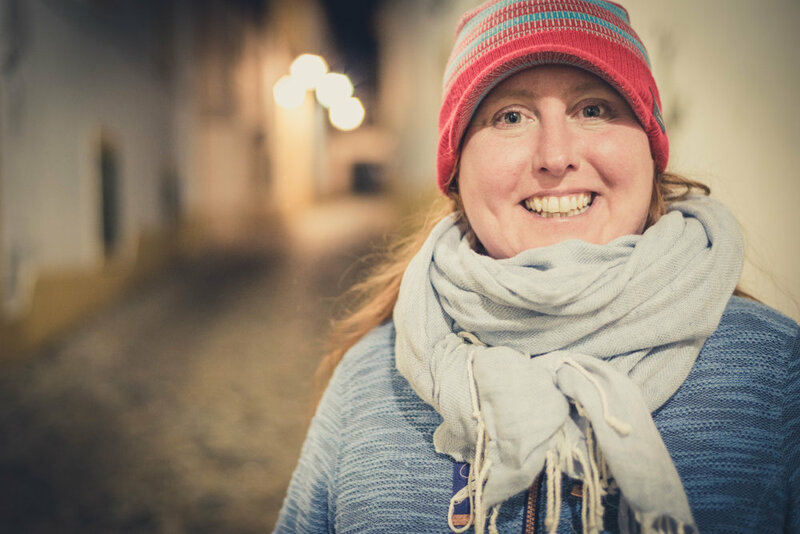 We were heading back to Lisbon to give back the rental car and go home to Dublin for Christmas but we had one more adventure planned for ourselves. 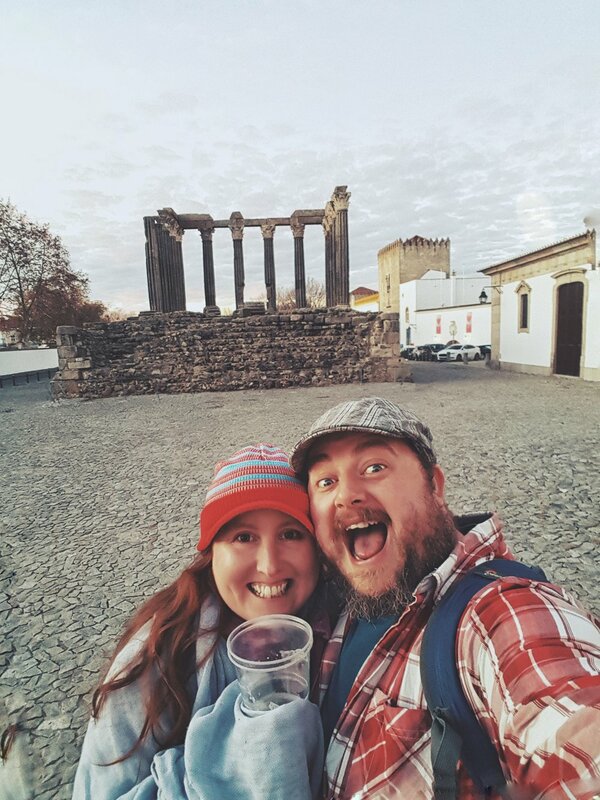 We decided to squeeze in an overnight stay in Évora which had been recommended to us by our friends Jon and Sarah from www.lifepart2.com and their travel tips are always excellent! 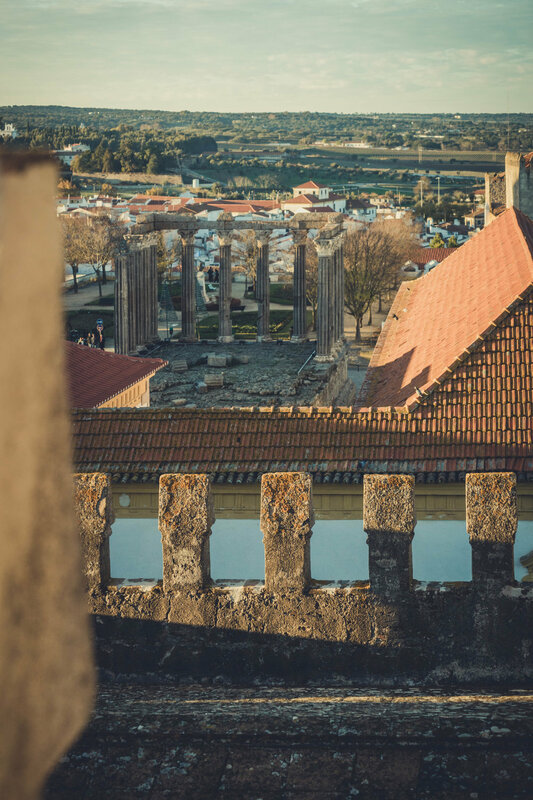 Évora is an old Roman trading town and there, still stands, an impressive Roman ruin, one of the best preserved on the Iberian peninsula. 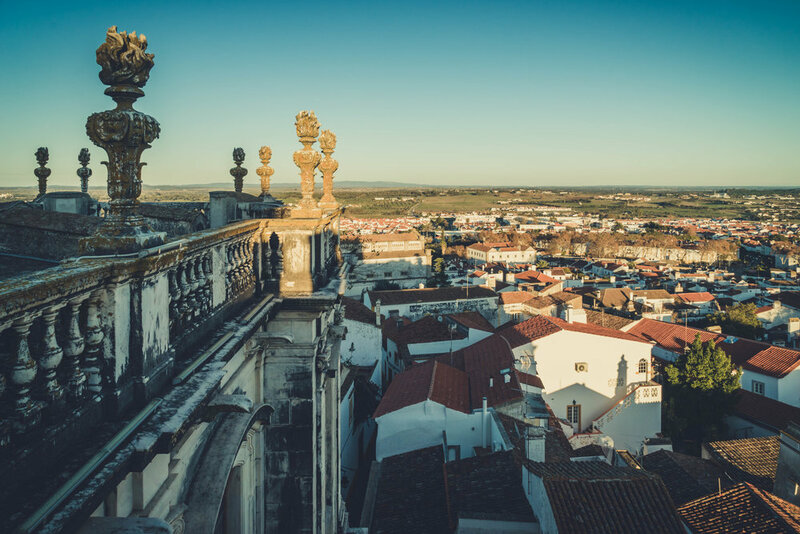 It took us about 3 hours from the Algarve to Évora and it wasn’t too stressful. At this stage, I was well used to the roads and the Portuguese drivers. 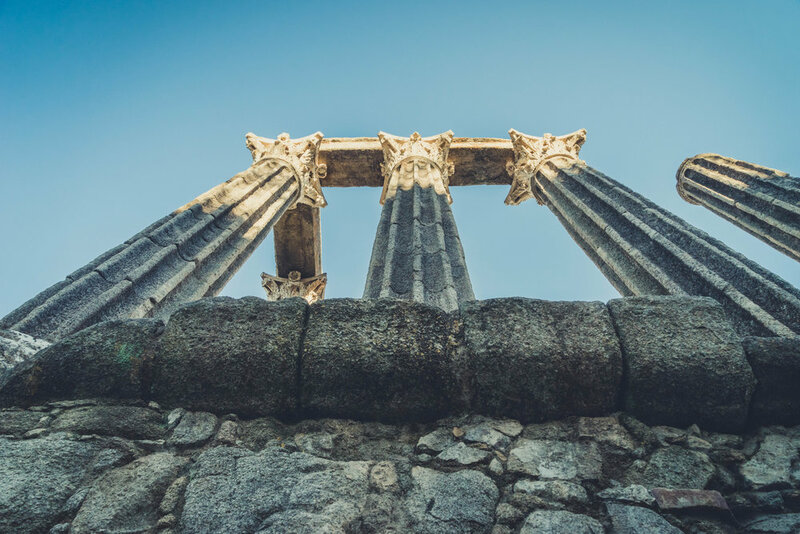 Passing cork forests and vineyards, we thoroughly enjoyed driving through the Alentejo region and after leaving the highway, we could see the city rising up before us, standing out above the landscape. As we got closer we could see the high walls of the old town and we headed straight for them. Our little guesthouse was somewhere in among the beautiful old buildings and cobbled streets so we found parking and walked around. We weren’t expecting it to be busy because it was December but coming up to Christmas, the place was buzzing with shoppers and day trippers from Lisbon. It’s an easy and comfortable train ride from Lisbon’s Oriente Station but it only runs four times a day and less on weekends. If you want more flexibility, hop on the hourly Rede Expressos bus from Sete Rios Bus Station. 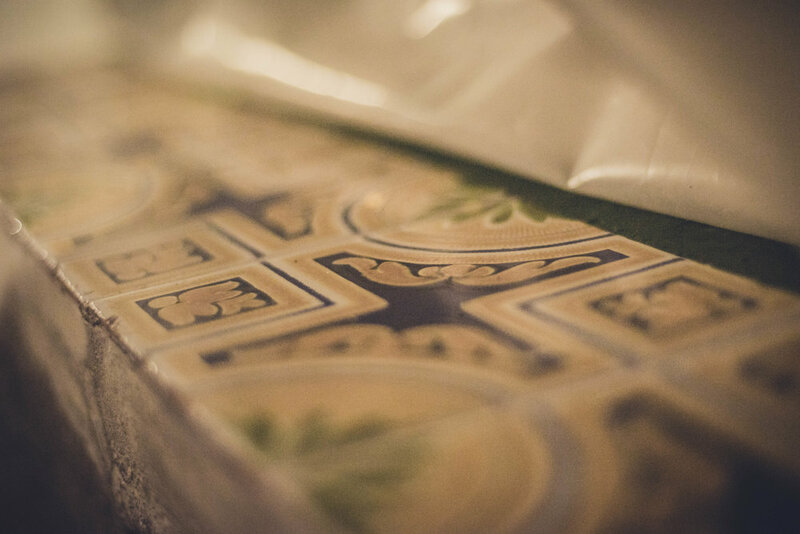 The journey on either service is less than 2 hours so you can spend a whole day enjoying the sights and delicious food. Our guesthouse, Casa dos Teles, was a little hard to find. With no hint of a definite entrance, there were signs pointing to another building a couple of doors down and then another pointing back to where we came from! Hearts started to sink as we thought we’d made a phantom booking (mostly that was me, I always start to panic too soon when things look like they’re going slightly pear-shaped!). Finally, with the help of the friendly shop owner next door, we were brought to a beautiful 19th-century building. It’s evident from the black and white photos adorning the walls of the reception area, the building has been in the family for generations and it feels like walking into a family home. We were warmly welcomed by our lovely host and even with very little English, our check-in was easy. We were brought through the house and we had a chance to admire the gorgeously decorated living room where you can relax and enjoy some coffee and pastries. Our room had a T.V. and conveniently, a fridge and a kettle. 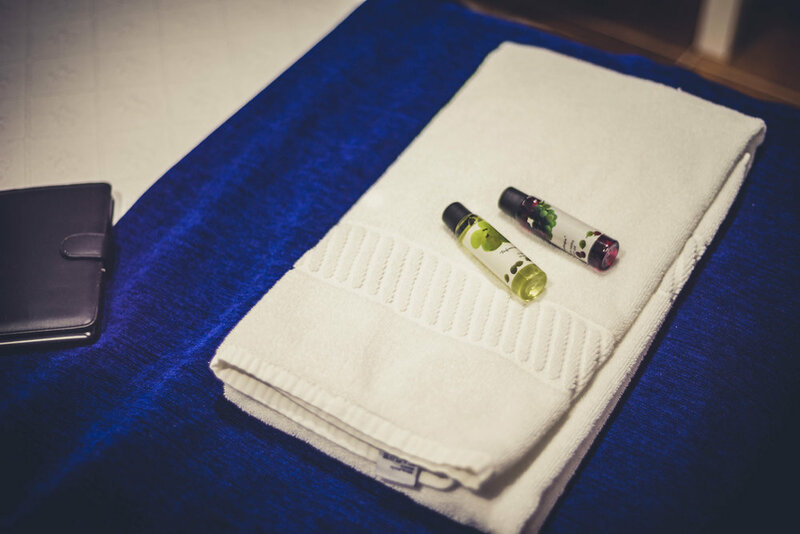 The bed was very comfortable and our en-suite bathroom was spotless and had plenty of hot water. We felt immediately at home and it was nice and cosy, even in December. The best thing about the guesthouse is its location. 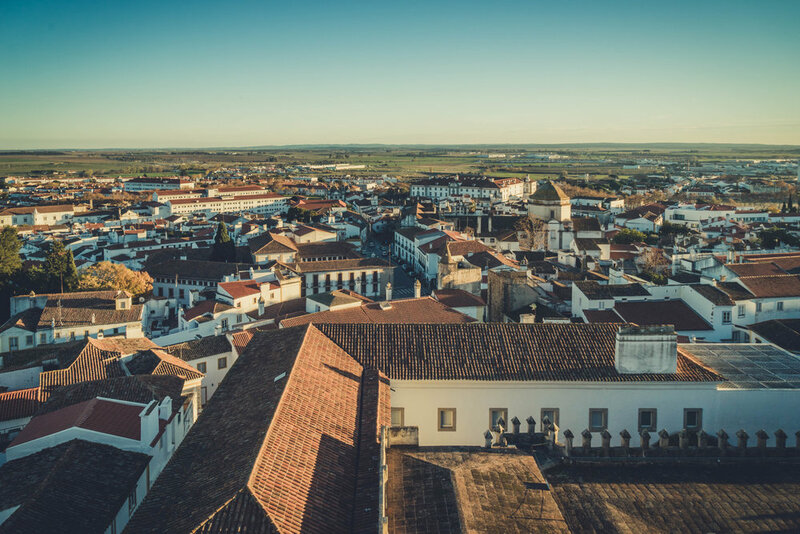 It is perfect for strolling around the historic centre of Évora, rightly given it’s UNESCO heritage status. 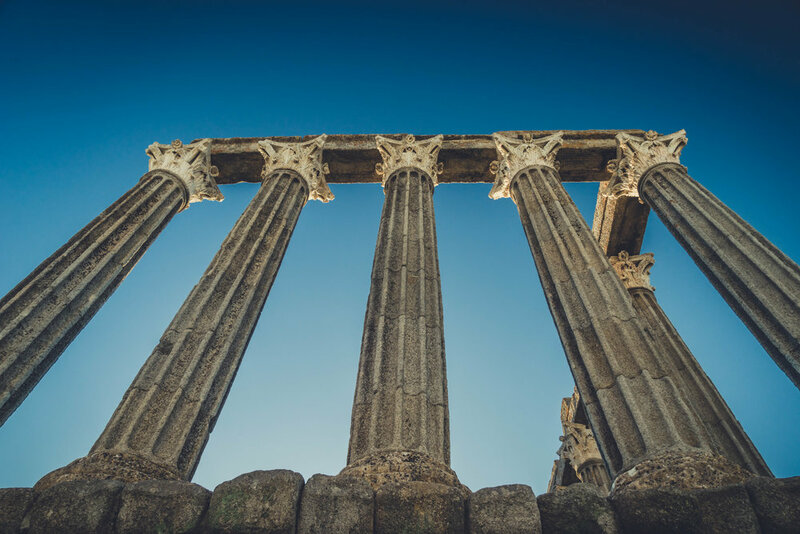 It's only a five-minute walk to the famous ruins and the spectacular Gothic Cathedral which is why we didn’t linger in the room too long, as it was coming up to the golden hour. The Roman Temple of Diana called to us and Neil was very excited to see his first Roman ruin. He armed himself with his Sony A7ii and tripod and we set off up through the town. On a side note, here’s a weird sight we never saw before. The shop windows had real people instead of mannequins. Women and girls, adorned in the latest fashions, were waving and smiling from the other side of the glass. Still not sure how I feel about it - just wanted to put it out there! If any of you read this and have seen it before, please leave us a comment below! Half distracted by live mannequins, we wandered past souvenir stalls and enticing little bars and cafés but we kept our focus on making it to the Temple. It didn’t disappoint. It is a striking structure with most of the huge columns still perfectly intact, albeit roofless. 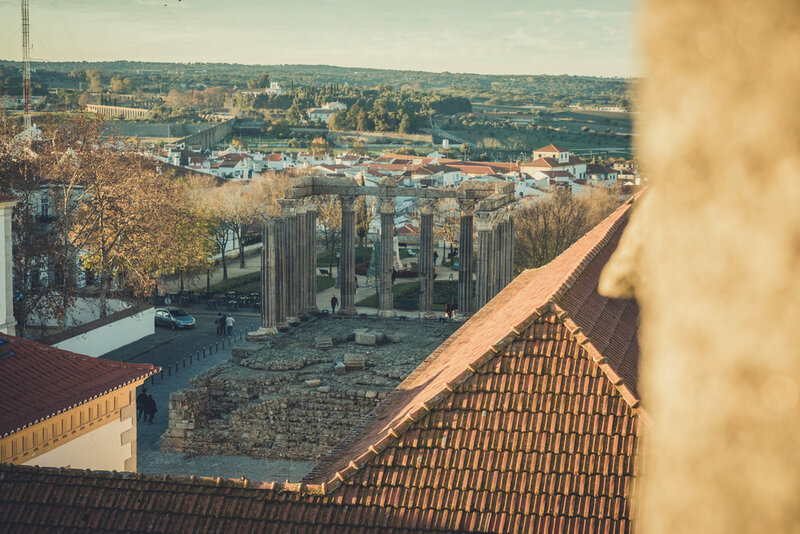 Built on the highest hill, it dominated the Alentejo landscape when Évora became one of the most important trading outposts in the Roman Empire. It was more than likely built in honour of Emperor Augustus and was later incorrectly named as a Temple to Diana. It was almost destroyed by invading Moors but survived and served a variety of purposes throughout the centuries, even as a butcher’s. It has since been repaired enough to protect it from collapsing but that hasn’t detracted from the ambience of its 2000 years of existence. On the opposite side of the square stands the mighty Cathedral of Évora, the largest in Portugal. As we knew we would be leaving the following day, we wanted to make the most of our time and managed to catch the last half hour before it closed for the evening. Our plan was to get to the roof for part of the golden hour and then get back to the Temple for sunset. It worked out perfectly. The views from the top of the cathedral are outstanding and the Gothic features silhouetted against the setting sun made for some fantastic photos. We had just enough time to walk through the huge cloisters that surround the orange trees in the interior courtyard and we caught glimpses of the priceless renaissance artwork and carvings. We were the last to leave at closing time but we could easily go back and spend more time exploring, it’s well worth it. We headed back to the square to set up the tripod and capture the fading light through the Temple. As we stood admiring it, we noticed a few other photographers setting up in the square to try and capture the perfect shot. We enjoyed a beer and pistachios from the nearby kiosk as we chilled out and waited for the sun to set. This a top tip if you’re an aspiring photographer and looking for some great compositions. Neil had booked us into a restaurant about a week in advance as it’s tiny and extremely popular. We recommend you do the same as we saw people being turned away at the door. You can do it on their facebook page here. I have to be honest, we were scared! We aren’t afraid of a food adventure but not knowing anything about the food and no menu, had us questioning our choice! We were so warmly welcomed though, it felt like we walked into somebody’s dining room, invited in for dinner. We immediately felt at ease when we were told there’s a special menu for first timers that suits even a picky palate. Our hosts couldn’t have been nicer and more attentive. A father and daughter team handled the front of the house while his mother and father worked hard, creating course after course of delicious hearty, homemade food. When we sat down first, we were pretty much told which wine will go best with the food and we happily agreed to drink it! Delicious cheeses along with black sausage, served with a variety of jams like pumpkin and chilli came along first, to wet our appetite. We weren’t long waiting for our main course. A slow cooked, braised-to-perfection pork neck with spinach and breaded cauliflower filled us up but not enough for us to ignore the sweet walnut and honey cake with a side of creamy nata (custard). It all sounds so simple but it was extraordinarily tasty and perfectly cooked. We concluded it was one of the finest meals we’d had so far. We would definitely place this restaurant in our top 5 in Portugal. It was the perfect end to a perfect day and we went to bed happy and tired. We got up early next morning to head to Lisbon and drop off the rental car. We had a quick stop to look at the Roman aqueduct that straddles the town and all the tiny houses that are squeezed in between its arches. Unfortunately, we didn’t have time to visit the Bone Chapel but we heard it’s definitely something to see. We always wish we have more time don’t we?! Definitely get to the top of the Cathedral, the views are spectacular. Even if you’re not interested in religious artefacts and churches in general, it’s a beautiful building and you can’t help but be in awe of the Gothic architecture. Don’t forget to check out the aqueduct, it’s fascinating. Finally, do try your best to get a reservation at the restaurant it’s like a private dining experience, not to be missed!